Earlier this year a dear friend of mine, Iris Higgins the author of the website "The Daily Dietribe" asked me if I would like to try a few recipes from one of her new books, "The Essential Gluten-Free Baking Guide, Part 2." I was delighted. Iris is a registered hypnotherapist with a master's degree in psychology and is working on her second master's in nutrition. Iris is also a passionate writer with a love of living holistically. Adding to her list of accomplishments, Iris also has a private wellness coaching practice in which she helps women to have a healthy relationship with food, with their bodies, and with their emotional, physical, and spiritual health. And on top of ALL of that? Iris somehow finds the time to create recipes of all sorts! Iris' new cookbooks are published by Triumph Dining. They are entitled, "The Essential Gluten-Free Baking Guides Part 1 and Part 2." Iris along with her co-writer and co-recipe developer Brittany Angell (author of Real Sustenance) studied and experimented with 12 different gluten-free flours to learn about their properties and how they worked best. Then they both worked tirelessly to develop a number of recipes for each gluten-free flour. One of the recipes I have tried so far are her basic Brownies. The brownies are very simple and are made with a new gluten-free flour called cassava flour. Cassava flour is made from the same plant as tapioca starch. I made the brownies in a round glass pie pan for dessert one night last week. WE LOVED them! My inlaws had no idea they were gluten-free! They were gooey and rich and super crispy on the outside. The brownies were perfect with coconut milk ice-cream! The next recipe I tried from Iris' book was her Yeast-Free, Vegan Sandwich Bread. This bread is simply amazing. I truly don't know how else to describe it. I have tried for YEARS to create a yeast-free bread that tastes like a normal sandwich bread. A yeast-free bread that doesn't crumble when it's cut, that is sturdy, yet pliable. That just tastes like good sandwich bread...and Iris' recipe nails it, plain and simple. I have several friends who cannot tolerate yeast and I love baking egg-free (mostly because it's cheaper) so personally to me, this recipe alone is worth the cost of the book!! This recipe uses sorghum flour, teff flour, and potato starch. It is a super light, fluffy bread and it contains a secret ingredient to give it structure and a texture that is incredibly similar to yeast bread. It's seriously easy to make and I think this bread is my new weekly sandwich bread. I love that it doesn't use eggs and it's a high fiber, "normal" sized loaf of bread. Basically this book along with the first, are both THE ESSENTIAL books you need to learn about the most useful gluten-free flours and the best ways to incorporate them into your everyday baking. 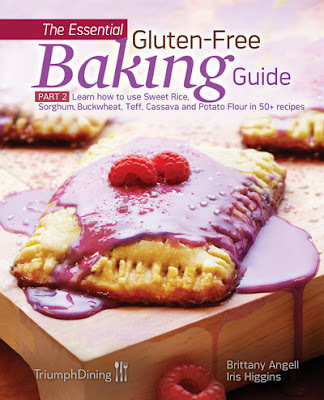 There aren't many books that I would recommend to people who are learning how to bake gluten-free... but these books? Get them. Use them. And have a whole lot more fun baking gluten-free! Iris...you're a genius girl. Simply genius! And those pastry tarts... I'm so making those next! Carrie, this is such a sweet review! Thank you for testing out our recipes! I can't wait to try your slow cooker recipes...I'm such a fan of meals that make themselves! Ohhh thanks for this. I definitely need that bread recipe! Now I wish I'd bought one of the copies I was selling at the expo myself :) that bread looks great!